What a Day to be Alive: Running Schedule? So the stupid shin splints (moving forward I'll be referring to these as SSS) are back again. Yes, I could say that running two days in a row may not have been the smartest thing in the world given my tendency to get SSS, but I did it anyway. I'm starting to think the sneakers I do have aren't the right ones for me. So my plan is to go back and see about another pair of sneakers. 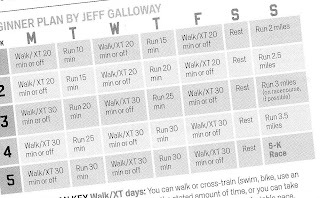 At any rate, I was reading last month's issue of Runner's World and came across the following 5k in 5 Weeks running schedule that I am going to try and follow as much as I can.